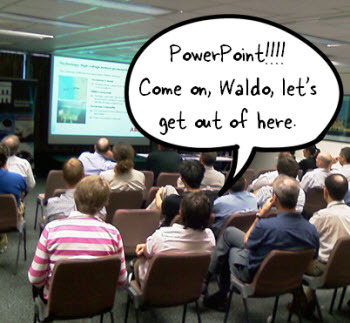 I know it’s hard to believe, but apparently, there are many people who don’t like PowerPoint. Obviously, there are a lot of bad presentations created with PowerPoint, but it seems to me the blame rests on the shoulders of the presenter and not the tool. Besides, PowerPoint’s a versatile tool that’s used for more than bad presentations. Personally, I think PowerPoint’s one of the single best multimedia applications. The secret is to look at PowerPoint in a different way. And once you do that you’ll see that it offers an assortment of capabilities. 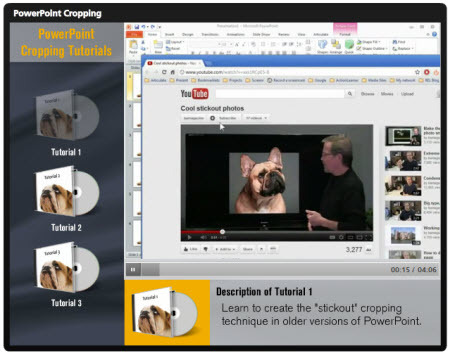 I just returned from the Training 2012 Conference in Atlanta where I presented on some PowerPoint tips and tricks. For those of you who couldn’t attend, I’ve included links to PowerPoint resources that I’ve shared in previous sessions. 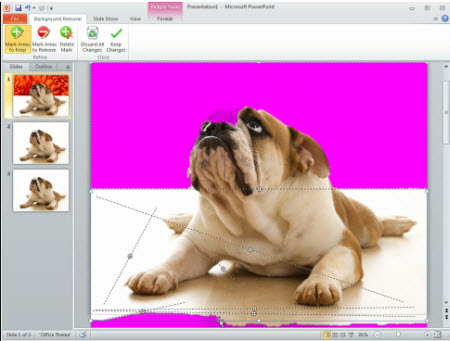 Recently, I was sharing how PowerPoint makes a good image editor. 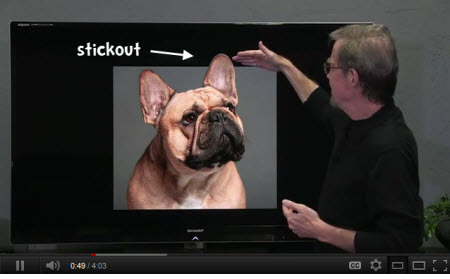 After the session, someone asked about this video where you learn to create a stickout effect that lets the image stick outside the box. It’s a basic cropping technique that allows you to open up the page and add more visual interest to the screen. The person wanted to know how to do that in PowerPoint. I like this question for a few reasons. It lets me demonstrate how PowerPoint can be used to edit images. And it helps teach more about the features and capabilities of PowerPoint in general. Even if you don’t use PowerPoint to do this on a regular basis, practicing this technique is an excellent way to learn more about PowerPoint’s features. So let’s look at a few ways to create the “stickout” effect in PowerPoint. Click here to view tutorial 1. 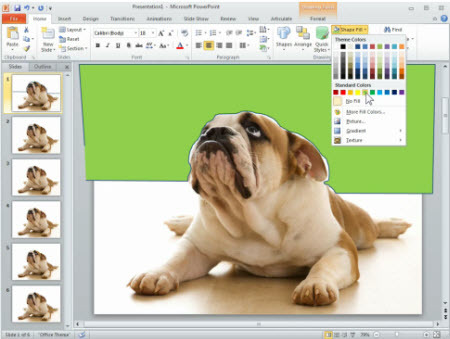 PowerPoint 2010 has a background removal feature. However, if you’re using older versions of PowerPoint you can still get the stickout effect. This tutorial shows how. Click here to view tutorial 2. In this tutorial you learn to use PowerPoint 2010’s background removal feature to create the stickout effect. Click here to view tutorial3. This tutorial combines the background removal feature with a duplicate image. Learning to work with layers and multiple images is definitely going to open possibilities when editing images in PowerPoint. I know some of you can’t access the YouTube tutorials at work, so I downloaded the video files and used them to test a drag and drop video player idea in Articulate Storyline. You drag the DVD icon to the orange box and it loads the video. The cool thing is that it only took a few minutes to build the functionality. 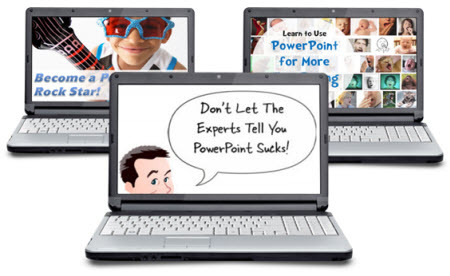 Click here to view the three PowerPoint tutorials. You may never need to use this specific image editing technique in PowerPoint, but going through these tutorials will help you learn more about PowerPoint’s features and develop a greater appreciation for the application’s capabilities. This is really great Tom! I don’t have Photoshop here at work so it is good to know that I can use Powerpoint to edit pictures. Now, I am no longer have to wait for my colleague to finish using his/her computer. Thanks Tom! Tom, you have done it again. You got the creative juices flowing. My questions is how did you create the consolidated tutorial skin. I am really interested in that. Please share. @Bradley: I was testing some things in Articulate Storyline and decided to use the videos to build a simple drag and drop player. Yes, please share how to create a skin similar to the one you used for the three tutorial videos in the future. I really like that concept. 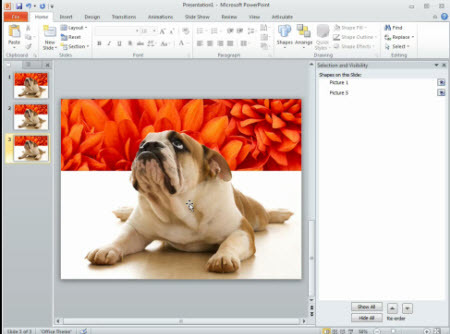 @Dustin: for that demo I used Articulate Storyline. But if you want to create it in Presenter you can do the same but without the drag and drop. The icons would like to different slides with the videos on them. Tom Cool Man … please, please, please stop teasing us with Storyline. @Sam: trying not to tease. 🙂 We’re working hard to get it out the door. I have to beta test it so doing the testing and blog posts lets me do two things at once. Oh yes!! This is SO fantastic!! Thanks, Tom. Great tips. I´ve used Gimp to crop, but PPT is better. this is so brilliant!! im going to try this ASAP!! Like the way Storyline takes over from the blog topic! I too was looking at the way it was presented rather than the tutorial, and thinking: that’s gotta be Storyline. I am beta testing too, and it’s really great. The overall message in this post (aside from the attraction to Storyline) is what you mentioned early on – Most often it’s the presenter and not the tool and with PowerPoint 2007 and 2010 it is one of the easiest and simplest to learn when it comes to manipulating images. Doesn’t have all the bells & whistles like Photoshop, but it allows designers to stay within one tool and get a really quality output. Thanks Tom. Its really great information and tips this will be helpful for learners also. Thanks for the tips on Power Point. It seems to a much used tool that needs more understanding. Great post with all these useful tips on power point it will be really helpful for me when I am working on client machines were we don’t have Photoshop all the time. Thanks for sharing. Thanks for those wonderful tips, I’m sure its’s gonna improve my Powerpoint making skills a lot ! !